A two-dimensional (2D) array stores elements in a grid. 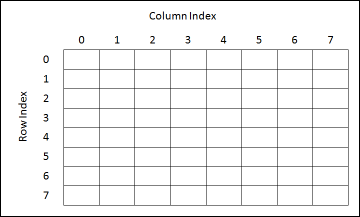 It requires a column index and a row index to locate an element. 2D array controls and indicators have two index displays to navigate to specific indexes. Top index display—Controls the row index to display in the array control. Bottom index display—Controls the column index to display in the array control. Element display—Values in the 2D array.